Home Air Travel	When can kids safely fly without car seats on airplanes? Tip: If you will frequently use car seats on airplanes, make sure you get a great car seat for travel. 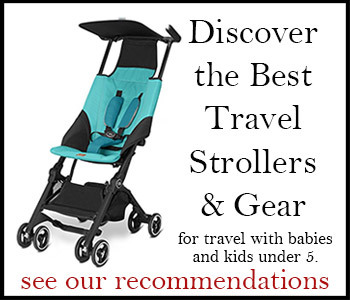 Here, the Sit N Stroll has converted from stroller to car seat mode, easily buckles in around the seat (not behind it) with a seat belt extension, and includes a sun canopy, which works well for blocking out reading lights and drafts during red-eye flights. With so much in the works around here recently (great stuff! I know I keep hinting, but I promise a big reveal soon…), the sixth birthday of this blog flew by without ceremony. What seems even more amazing, is that I purchased the www.TravelswithBaby.com website nine years ago, where I first began addressing travel with babies and toddlers. In that time, one of the most frequent topics I’ve visited and revisited has been the use of car seats on airplanes. In honor of Child Passenger Safety Week, I thought I should take a look at air travel specifically, and include a list of links to my most helpful tips and advice on using car seats on airplanes so far (see below). But where kids in car seats on the ground are subject to state and provincial laws, kids in the clouds are subject to a rather vague set of standards and suggestions, which can even very by airline should a particular carrier make its own rule about the use of car seats on its aircraft. With so much talk–and even controversy–about whether or not parents should use car seats on airplanes or the CARES harness when flying with young children, I thought we should also take a moment to address that glorious day when, according to the FAA children are safe to fly with the airplane safety belt alone. Remember, passenger safety issues in an airplane are different from what they are in a car, with turbulence being the number one cause of injuries to passengers of all ages. And while boosters may be required for increasingly older children around the world in an effort to keep shoulder safety belts off of their necks (which may, ironically, put the shoulder belt below their shoulder in some vehicles), there are no shoulder belts in coach seats at this time. Which is why booster seats, which are designed to be used only with shoulder belts are not permitted to be used on airplanes. Even if they would help your child see out the window during your flight. For now, the FAA states that children over 40 lbs. (18 kg.) are considered big enough to safely fly in their seats without a car seat (CRS) or the CARES child aviation restraint–though the CARES restraint is rated up to 44 lbs. Since children grow so differently from one to the next, and while one child might hit 40 lbs. in preschool while another won’t until second grade, I think the FAA might also include a recommended height to help parents determine whether their child is ready or not to fly without a car seat. Personally, I think it would be helpful for parents to have more information about the effectiveness of the brace position for children in the event of an emergency landing. For example, at what point (or height) are your child’s odds better if she can tuck and brace rather than sit with shoulders fixed to the airplane seat or car seat behind them with a safety harness, where she is more vulnerable to items that might be flying around the cabin? But since no two airplane emergency landings (a.k.a. crash landings) are the same, I realize it may be difficult to find conclusive evidence for this. I will be asking and looking, and please feel free to contact me if you know of any good sources for this I may have missed. How about you? Would you like more information about Have you been in an emergency landing on an airplane? When will you feel ready for your child to fly without a car seat or CARES? the FlyeBaby hammock I was lucky enough to test out with my youngest. And I know there will continue to be more! For more flying with baby, toddler, and preschooler tips and advice, be sure to bookmark this page.